First picks in my series of BEST picks. In my little corner of the world, October is characterized by red and orange foliage, cool and crisp temperatures, and the knowledge that although this is our best season it doesn't last very long. I think many Nova Scotians would agree that we thrive and look our best in the autumn so we try to make the most of it before winter comes. So my first BEST picks, are a tribute to my favorite season. A gorgeous little aceo-sized accordion book, which she describes as a bridge between summer and autumn. Such an artistic notion! She has a few other books in this style too, and only $5! Wow, everyone should have one! 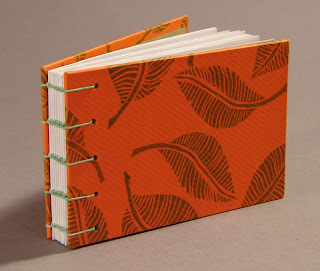 A Coptic sewn journal with brilliant orange cover papers, which she hand-printed from a Linoleum stamp that she designed and carved. And the leaves on the trees in my backyard really do turn bright orange this month, so this book is perfect. Wow! I am so honored to be in the first BEST picks! The other book is beautiful. Excitement! What a wonderful way to to start the day - seeing my little book on the first BEST picks...and in lovely company! Thank you so much! I'm looking forward to BEST picks as a way to peek at everyone's work.